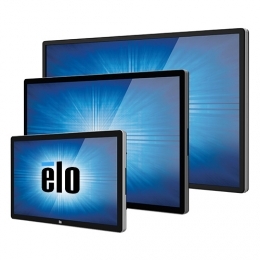 With their performance, design and innovative technologies, the Elo Touch Solutions Interactive Digital Signage Displays open a new dimension for large format touchmonitors. For professional digital signage applications, these touch displays are available in sizes of 81.3 cm (32''), 106.7 cm (42''), 116.8 cm (46''), 138.6 cm (55'') and 176.6 cm (70''). Using these units, you not only implement high-end solutions for visitor and customer systems in hotels, shopping centres, offices and public buildings, but also interactively involve the user in the application. Through their modular design, the touchmonitors can be subsequently expanded in a few steps into fully-fledged complete PCs with high computing performance. Interactive systems generate a high degree of fascination with users. Consumers can inform themselves about special offers as well as find sought-after products on the interactive site plan. An enormous information and comparison possibility with real-time feedback fulfil many customers' requests directly on-site, while employees concentrate on other tasks at hand. Unlike other traditional monitor adverts, the customer requests specifically the information he is interested in having. This prevents straying, while encouraging customer interest through active involvement. This type of use is particularly effective in museums and at exhibitions, as an interactive guide in hotels and reception rooms, for presentation of goods at car dealers, as well as in retail. Another highlight of these systems is the optional easy expansion of the monitors with diverse high-performance PC components and operating systems: via a docking system, a module with integrated Intel processor is simply inserted, secured into position and is ready to go! The computer is neither visible, nor do cumbersome cables and power cords get in the way. You have a selection of various Intel or Qualcomm processors. A choice of Windows 7, Windows 8.1, Android or a version without operating system as well as numerous interfaces ensure extreme flexibility and conformity for all digital signage applications.